There is never a dull moment in our family. With that said, getting dinner on the table often starts with me scrounging through our refrigerator to see what I have on hand. I don’t recommend this disorganized strategy at all, especially when it’s 6 pm and there are hungry kids constantly asking when dinner will be ready. But on a positive note, the time constraint and the use of limited ingredients can also be a time of creative recipe development. Last week I decided to make simple chicken kabobs. I cubed some chicken breasts, seasoned it with olive oil, salt, pepper, and thyme. Sort of. What I thought was thyme was actually dill. I buy many of my seasonings in bulk and refill these glass spice jars my husband bought from Ikea. Somehow my thyme container was filled with dill and I didn’t realize this until I was massaging the chicken and I could smell the dill on my hands. Then I had an epiphany. If I can season salmon this way, why not chicken? So I grabbed a lemon, squeezed its juices out, and massaged the chicken once again. From there I quickly skewered the chicken and grilled it. 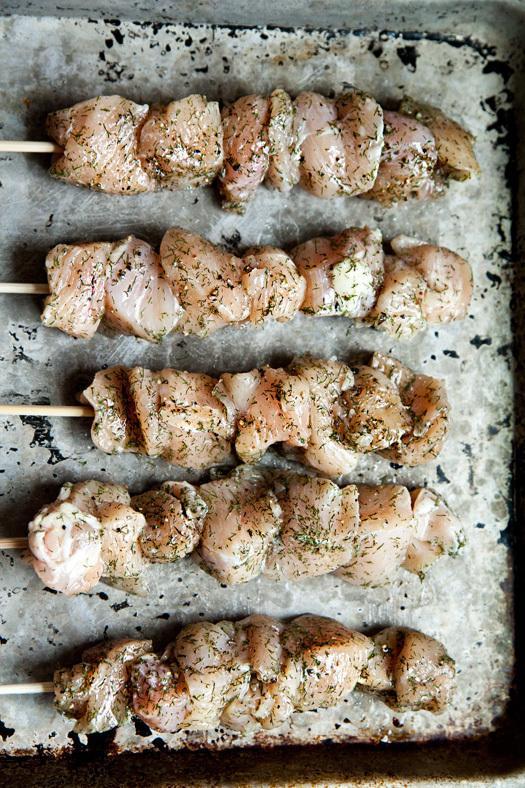 I was really excited to try the lemon dill chicken kabobs. Let me tell you, not only were they fabulous, everyone loved them. We ended up making them again a few nights later. I have to tell you, this is one of those types of recipes which requires so little work but pays off huge in flavor. Any left over chicken tastes really good cold in salads, too. The simplicity of this chicken dish makes it a new family favorite. Hope you all enjoy it, too! 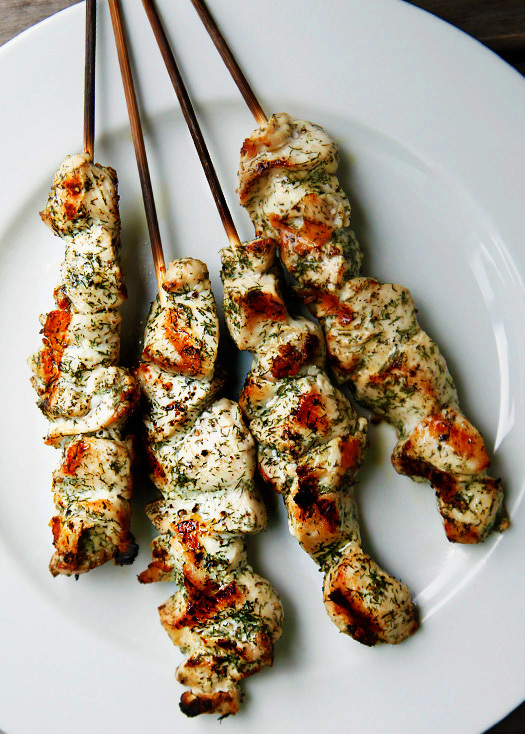 A quick and easy recipe for flavorful chicken skewers. Heat the grill on medium-high heat. Cut the chicken breast into 1- 1½ inch cubes. Transfer the cubed chicken to a bowl. Add the olive oil and lemon juice to the chicken and begin massaging the meat with your hand for thirty seconds. Add the dill, salt, and pepper, and continue to massage the meat for another thirty seconds. Skewer 6-8 pieces of chicken on each stick. Carefully pour some oil onto a paper towel, and using tongs, grease the grill. 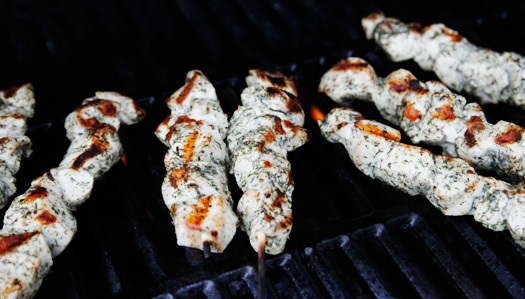 Place the chicken kabobs on the grill and cook for 7-10 minutes, turning the chicken over half way though the process. I made this for dinner last night, it was so good! I can’t believe the flavor after marinating for such a short time. Thanks so much! I made these tonight and they were so good…I wish I’d made two batches! I brined them for an hour and then marinated them for an hour. I also added the zest from the lemon to the marinade and used fresh dill since it was all I had. Since I bought chicken tenderloins (it’s what was on sale) I didn’t cube them, I just grilled as they were. I ate 1/2 the batch myself and I’m bummed I only have enough left over for one lunch. I think I’m going to need to plant some more dill because I see this being a regular dish in our house! Thanks! I was intrigued with this recipe. I have fond memories of picking dill out of my grandmother’s garden to use for Hungarian pickles. The smell is amazing. It just had never occurred to me to put it on, or even with, chicken. As I cut up a whole chicken the other night I went to reach for the usual sage and then remembered reading this recipe the night before. The dill mixed with some garlic and onion powder made a fantastic rub. I squeezed some fresh lemons over all of it and roasted it in the oven. Oh my goodness! My family raved over how fantastic and “summery” it tasted. My hubby wanted to know what ever possessed me to put dill on the chicken. I told him the exact same woman who gave the ‘to die for” chocolate chip cookie recipe that we had for dessert. He sends his heartfelt gratitude and thanks! So do I! Tried tonight….Easy, Fast, Delicious, Healthy! Kids loved it too. It was 6pm when I was reading this post so decided to try it. My family LOVED it. Thanks for a great recipe! I like the idea of the kalbobs, Instead I used pork and I thought that they were a little bland, so i added green bell peppers and drissled them with honey and soy sause. they were really yummy after that. but also they probably would have tasted better with chicken, since I used pork. I will not forget this recipe, I will not forget this recipe… They look very good. I’d love to actually use some of the dill from the garden, rather than turning it under. I love this! So quick and easy for a weeknight. I think I probably have those same glass containers from Ikea and I have a couple of similar looking spices in mine, I can see myself doing the same thing you did. What a happy mistake!